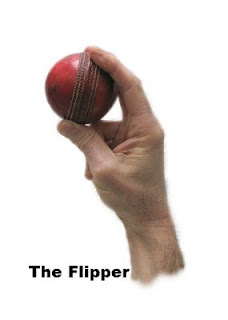 The history of the Flipper goes way back beyond Warne and Benaud. In the 1930's Clarrie Grimmett in his book 'Getting Wickets' explains in some detail the potential of putting spin on the ball using the click of the fingers. (Click on the image below to see an explanation and demo). But the delivery precedes Grimmett and in his books Grimmett explains that he came across it via one of the famous bowlers from the 'Under-arm' bowling era of cricket.